Gov. 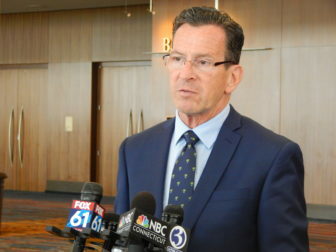 Dannel P. Malloy recommended deeper cuts to municipal aid and elimination of an early childhood education program to help close a $121 million hole in his latest budget proposal for this fiscal year and next. The governor, who sent his adjustments to legislative leaders Thursday, also would reduce state contributions to a supplemental retirement health care program for teachers, potentially boosting costs for future retirees. The governor would save $25.3 million over this fiscal year and next combined by reducing state payments into the retiree health care fund for teachers. The association representing this group has argued for years that the fund is at risk of insolvency in the near future. Another of the governor’s largest proposed cuts, involving a total of $20 million, would be imposed starting in 2018-19, to grants used to reimbursement municipalities because they cannot tax property owned by the state, or by private, nonprofit colleges and hospitals. A third cut, worth $20 million total across this fiscal year and next, involves new funding for the Smart Start program run by the Office of Early Childhood. Launched by Malloy and legislators in 2014, “Smart Start” was an ambitious long-term initiative to move the state closer to offering universal, high-quality preschool. Spending was supposed to be boosted by $15 million in 2014-15 and then increase by another $20 million annually until 2024. But that plan largely has fallen by the wayside as the state budget has struggled with deficits in each of the past three fiscal years, and major shortfalls are projected for this fiscal year and next as well. The administration also wants to reduce funding for debt service by $10 million both this fiscal year and next. This has been controversial in the past because it has led state government to become increasingly reliant on bond premiums — special proceeds the state receives as part of a complex process when borrowing funds for capital projects at a higher than normal rate. These premiums or borrowed funds then are used to cover other debt payments on other borrowing. According to state Treasurer Denise L. Nappier’s office, Connecticut added $554 million to its bonded debt between 2011 and 2016 through its use of proceeds from bond premiums. With more than $23 billion in bonded debt, Connecticut ranks as one of the most indebted states, per capita, in the nation. The administration acknowledged this week that the $40.6 billion, two-year budget Malloy unveiled on May 15 was out of balance by $46.7 million in 2017-18 and by $74.5 million in 2018-19. Those numbers represent projected labor cost savings that couldn’t be achieved if a tentative concessions agreement between the governor and state employee unions is ratified by workers and by the legislature. Those cost-saving measures — which largely involve reducing staff and closing and consolidating facilities — would require layoffs that would be prohibited for four years under the pending concessions deal. Malloy’s two-year budget is built on the assumption that the concessions deal is ratified and provides $1.57 billion in savings. Union voting on that agreement is scheduled to conclude Monday.